Gaby Monkhouse and her husband Gus Glue with their vessel 'Highland Lassie' on the Caledonian Canal. Restoration works have been completed on a former trawler boat turned into a floating hotel. The Highland Lassie made the 10 hour voyage to Macduff shipyards in January to be restored to her former glory. 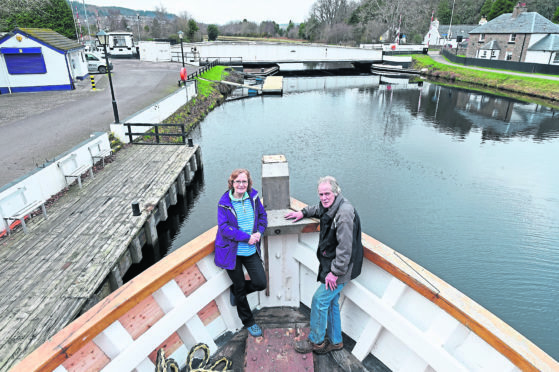 The vessel is in line to become a five-star luxury floating hotel on the Caledonian Canal, with the first wave of guests expected to be on board in the Spring. The £300,000 project has been a labour of love for Gaby Monkhouse, 61, and her husband Gus Glue, 70, since they bought the boat more than a decade ago. Mrs Monkhouse, who owns the Oakwood Restaurant in Dochgarroch, was really pleased with the work carried out on her beloved boat. She said: “She looked stunning; I always knew she would be. It was no big surprise for me. “It took about three weeks and a bit longer before we got her home. We were three weeks on the slip and then there were the delays in us getting her back home due to workload here in the restaurant. The two-storey vessel spent a total of three weeks on the slope as engineers from the north-east Scotland shipyard worked to restore the original paintwork on the hull. And the vessel attracted a lot of attention on its return journey home. Mrs Monkhouse added: “She attracted quite a bit of attention going up the canal, there were people there from London.